Andy and I wrote a Haskell library called Data.BufferBuilder (including Data.BufferBuilder.Utf8 and Data.BufferBuilder.Json) which makes it easy to safely and efficiently encode Haskell data structures into JSON. In our benchmarks, using Data.BufferBuilder.Json to encode JSON is 4-5x as fast as using Aeson. Even if you’re already using Aeson, you can benefit somewhat from BufferBuilder’s improved encoding performance. The buffer-builder-aeson package adds a ToJson instance for Aeson’s Value type, which our benchmarks show is 50% to 100% faster than Aeson’s built-in encoder. All you need to do is call Data.BufferBuilder.Json.encodeJson instead of Data.Aeson.encode! Why did we build BufferBuilder? Some of IMVU’s backend services are written in Haskell. While Haskell is incredible for many use cases, we ran into an unexpected bottleneck: JSON encoding. Our service response structure produces quite a lot of JSON, and much of that JSON contains URLs encoded into JSON strings. Amazingly, URL and JSON encoding was showing up as a significant cost center when generating JSON responses. Some services spent over a second encoding JSON! When faced with a performance problem, my first instinct is to either pound the problem into the ground or unmake the problem so the code isn’t necessary in the first place. A JSON response is represented in memory as a collection of varied, in-memory data structures. The response happens to contain many URLs — sometimes more than a hundred. URLs are represented by a data structure consisting of the protocol, hostname, path segments, query string, and so on. Each URL becomes a JSON string. Each in-memory data structure is converted to a JSON object whose properties depend on the type on the corresponding data structure. ToJSON instances convert Haskell data types to an AST of Aeson Values. The keys of an Aeson object are Text values. In memory, Text is encoded in UTF-16. Thus, URLs must be translated from their in-memory representation (ours is ASCII) into UTF-16 before they fit into the Aeson AST. Then, the entity bodies are converted into JSON objects, where the keys are known at compile-time, but must be encoded as UTF-16. The entire AST is encoded into a Lazy Text Builder. Then the Lazy Text is encoded into a Lazy ByteString containing UTF-8. Then, to generate the response body, the Lazy ByteString is concatenated into a single strict ByteString. This is where Andy and I sat down to create an API to let us cleanly express JSON encoding without sacrificing type safety OR performance. Because I’d been told that bouncing between Haskell and C with the foreign function interface can be slow, my first approach was to attempt to build a Haskell monad that grabbed the RealWorld token out of IO (IO a is basically a newtype around RealWorld -> (RealWorld, a)), augmented it with some extra “local variables” like the output ptr, capacity, and current size, and manually implemented allocation and memory writes with GHC.Prim APIs. GHC did not like this at all. The generated code ran 20 times slower than naive usage of Data.ByteString.Builder. Nonetheless, it was an interesting technique, so maybe I’ll write about it another time. Surely it was possible to do better. So I tried the foreign function interface after all. I wrote a tiny C API that allocated the underlying growable buffer. It provided APIs for appending bytes, buffers, UTF-16-to-UTF-8 transcoding, and so on. These FFI calls can only happen within IO actions, but building buffers is fundamentally a pure operation, and the provided Haskell API should be effectively pure. The solution is to offer a restricted state monad like ST which limits the operations within the monad to safe buffer-building operations. Obviously GHC’s code generator has some room to improve, but the main thrust is exactly right. An equivalent C++ API would generate much the same kind of code, modulo the poor instruction and register selection, which overall doesn’t matter too much here. In almost all situations, Haskell isn’t going to be as fast as straightforward C, but with some work and appropriate use of FFI, it’s possible to come close. Once we had an API to safely and efficiently build up buffers of bytes, we wanted to build safe APIs on top for constructing valid UTF-8 buffers and valid JSON. Utf8Builder is a newtype around BufferBuilder with a restricted API. If you only call safe functions in Data.BufferBuilder.Utf8, the result is guaranteed to be valid UTF-8. Unsafe functions are provided for when you know precisely what you’re doing. I suspect Data.BufferBuilder.Json is approaching the limit of how fast a JSON encoder can be. And thanks to the beauty of Haskell, it’s convenient and safe! If you’re using Aeson and encoding performance matters to you, give BufferBuilder a shot! This post concludes my obsession with JSON parsing. In fact, the entire reason I wrote a JSON parser was to show these graphs. I wanted to see whether I could write a JSON parser faster than any other when run in Emscripten. As vjson is typically faster, I did not succeed unless I requalify my goal as writing the fastest-in-Emscripten JSON parser with a useful parse tree. This benchmark’s code is on GitHub. I encourage you to reproduce my results and search for flaws. All benchmarks were run on a 2010 Macbook Pro, 2.53 GHz Core i5, 8 GB 1067 MHz DDR3. 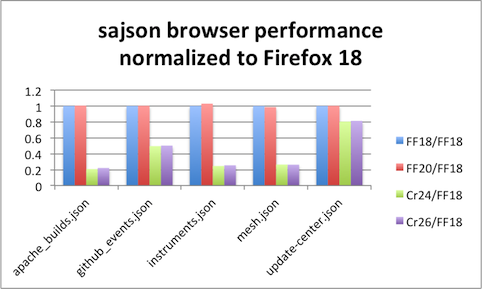 First, let’s compare native JSON parsing performance (clang 3.1, -O2) with both stable and nightly versions of Firefox and Chrome. Looking closely at the browser results, a third conclusion is clear. Firefox runs Emscripten’d code much faster than Chrome. Finally, sajson consistently performs better than rapidjson in my Emscripten tests. And vjson always parses the fastest. I believe this is because Emscripten and browser JITs punish larger code sizes. The previous graph only shows parse rates by browser and parser for a single file. Next let’s look at parse rates by file. Yep, native code consistently wins. At this point I want to dig into differences between the browsers, so I will show the same graph but without native code. Not only is Firefox consistently faster than Chrome, it’s faster by a factor of 2-5x! Finally, here the same graph but normalized against Firefox 18. If I were a Firefox JS developer, I’d be feeling pretty proud right now, assuming this experiment holds up to scrutiny. Even so, these results match my experience with Bullet/Emscripten in Chrome: Chrome takes a very long time to stabilize its JIT, and I’ve even seen it fail to stabilize, constantly deopting and then reoptimizing code. 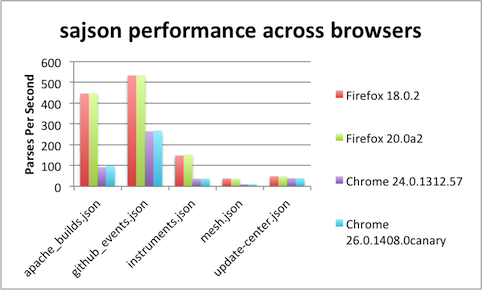 In contrast, Firefox may take longer to JIT up front, but performance is smooth afterwards. Further work is necessary to test the hypothesis that code size is the biggest predictor of Emscripten performance. Well, duh. You shouldn’t use an Emscripten’d JSON parser. You should use the browser’s built-in JSON.parse function. Shouldn’t you have compiled the Emscripten code with -fno-exceptions? Yes. Oops. That said, after generating the graphs, I did recompile with -fno-exceptions and it made no difference to the benchmark results in either Chrome or Firefox. I will soon post performance benchmarks of sajson, rapidjson, vjson, YAJL, and Jansson. However, before talking about performance, I want to compare the parse trees generated by each library. Object keys are sorted. Thus, random access of object elements is O(lg N). At its root, rapidjson is a SAX-style parser. However, rapidjson does provide a default DOM implementation. Array and Object length are not directly accessible in the API but are accessible via End() - Begin() or MemberEnd() - MemberBegin(). Differentiates between integers, unsigned integers, 64-bit integers, 64-bit unsigned integers, and doubles. Namespaces its symbols under the generic “json” prefix. Differentiates between integers and floats. No support for doubles. Array and Object lengths are not stored. Instead a linked list must be traversed to calculate the length. Random array access is O(N). Object element lookup is O(N), by walking a linked list. Differentiates between integers and doubles. Array and Object lengths are available. Object element lookup is O(N). Object element access is O(1) via a hash table. The parse tree is mutable. I’ve fixed all the known bugs and error cases in sajson. If you end up using it, I’d love to hear from you. I’ll capture some scattered thoughts before my JSON parsing obsession dies down. There’s not much opportunity to take advantage of a modern CPU’s superscalar execution pipeline when parsing JSON. Parsing JSON generally involves reading a character and branching. Searching for a string’s ending quotes could be implemented with vector instructions (see strchr in Agner Fog’s optimization manual or this tutorial) but the ROI doesn’t seem high to me. Either way, sajson is approximately done. I will post benchmarks soon. I previously argued that any tool whose running time is proportional with the number of files in a project scales quadratically with time. Bluem00 on Hacker News pointed me towards Tup, a scalable build system with goals similar to ibb. Mike Shal, Tup’s author, wrote Build System Rules and Algorithms, formalizing the algorithmic deficiencies with existing build systems and describing Tup’s implementation, a significant improvement over the status quo. I would like to document my analysis of Tup and whether I think it replaces ibb. Before we get started, I’d like to thank Mike Shal for being receptive to my comments. I sent him a draft of my analysis and his responses were thoughtful and complete. With his permission, I have folded his thoughts into the discussion below. Is Tup suitable as a general-purpose build system? Will it replace SCons or Jam or Make anytime soon? Should I continue working on ibb? Read the dependency graph from left to right: hello.c is compiled by gcc into a hello executable. Tup supports variable substitution and limited flow control. Inventing a new syntax unnecessarily slows adoption: by implementing GNU Make’s syntax, Tup would be a huge drop-in improvement to existing build systems. Even though specifying dependency graphs is naturally declarative, I think a declarative syntax is a mistake. Build systems are a first-class component of your software and your team’s workflow. You should be able to develop them in a well-known, high-level language such as Python or Ruby, especially since those languages come with rich libraries. As an example, SCons gets this right: it’s trivial for me to write CPU autodetection logic for parallel builds in a build script if that makes sense. Or I can extend SCons’s Node system to download source files from the web. Tup is 15,000 lines of C. There’s no inherent problem with C, but I do think a community-supported project is more likely to thrive in a faster and safer language, such as Python or Ruby. Having worked with teams of engineers, it’s clear that most engineers can safely work in Python with hardly any spin-up time. I can’t say the same of C.
Git is an interesting case study: The core performance-sensitive data structures and algorithms are written in C, but many of its interesting features are written in Perl or sh, including git-stash, git-svn, and git-bisect. Unlike Git, I claim Python and Ruby are plenty efficient for the entirety of a scalable build system. Worst case, the dependency graph could live in C and everything else could stay in Python. The Tup paper mentions offhand that it’s trivial to monitor a compiler’s file accesses and thus determine its true dependencies for generating a particular set of outputs. The existing implementation uses a LD_PRELOAD shim to monitor all file accesses attempted by, say, gcc, and treats those as canonical input files. Clever! No implicit dependencies (such as C++ header file includes) need be specified — if all dependencies come from the command line or a file, Tup will know them all. It’s easy to implement. Tup’s ldpreload.c is a mere 500 lines. Any realistic build system must treat Windows as a first-class citizen. Perhaps, on Windows, Tup could use something like Detours. I’ll have to investigate that. Intercepting system calls is reliable when the set of system calls is known and finite. However, there’s nothing stopping the OS vendor from adding new system calls that modify files. Incremental linking / external PDB files: these Visual C++ features both read and write the same file in one compile command. SCons calls this a SideEffect: commands that share a SideEffect cannot parallelize. A build system that does not support incremental linking or external symbols would face resistance among Visual C++ users. I haven’t completely thought this through, but it may be important to support user-defined dependency scanners that run before command execution, enabling tools such as graph debugging. I don’t have a realistic example, but imagine a compiler that reads spurious dependency changes from run to run; say, a compiler that only checks its license file on every other day. Stepping back, I think the core build system should not be responsible for dependency scanning. By focusing on dependency graph semantics and leaving dependency scanning up to individual tools (which may or may not use LD_PRELOAD or similar techniques), a build system can generalize to uses beyond compiling software, as I mentioned in my previous blog post. It simplifies the representation of multiple-input multiple-output commands. Some commands, such as “run-test foo” or “search-regex some. *regex” depend on source files but produce no files as output. Since they fit naturally into the build DAG, commands are a first-class concept. Tup, like SCons, places a huge emphasis on build reliability. This is key and I couldn’t agree more. In the half-decade I’ve used SCons, I can count the number of broken builds on one hand. Sadly, many software developers are used to typing “make clean” or clicking “full rebuild” when something is weird. What a huge source of waste! Developers should trust the build system as much as their compiler, and the build system should go out of its way to help engineers specify complete and accurate dependencies. Changes are tracked by file contents, not timestamps. The dependency graph, including implicit dependencies such as header files and build commands, is complete and accurate by default. Compiler command lines are included in the DAG. Put another way: if the command used to build a file changes, the file must be rebuilt. Tup takes a strict functional approach and formalizes build state as a set of files and their contents. (I would argue build state also includes file metadata such as file names and timestamps, at least if the compiler uses such information.) If the build state does not change between invocations, then no work must be done. Tup even takes build reliability one step further than SCons: If you rename a target file in the build script, Tup actually deletes the old built target before rebuilding the new one. Thus, you will never have stale target executables lying around in your build tree. Nonetheless, there are situations where a project may choose to sacrifice absolute reliability for significant improvements in build speed, such as incremental linking discussed above. A build system is a critical component of any software team’s development process. Since every team is different, it’s essential that a build system is flexible and extensible. SCons, for example, correctly chose to implement build scripts in a high-level language (Python) with a declarative API for specifying nodes and edges in the dependency graph. However, I think SCons did not succeed at separating its core engine from its community. SCons tightly couples the underlying dependency graph with support for tools like Visual C++, gcc, and version control. The frozen and documented SCons API is fairly high-level while the (interesting) internals are treated as private APIs. It should be the opposite: a dependency graph is a narrow, stable, and general API. By simplifying and documenting the DAG API, SCons could enable broader uses, such as unit test execution. Like Tup’s author, I agree that build autoconfiguration (such as autoconf or SCons’s Configure support) should not live in the core build system. Autoconfiguration is simply an argument that build scripts should be specified in a general programming language and that the community should develop competing autoconfiguration systems. If a particular autoconfiguration system succeeds in the marketplace, then, by all means, ship it with your build tool. Either way, it shouldn’t have access to any internal APIs. Configuration mechanisms are highly environment-sensitive and are best maintained by the community anyway. Visual C++ greatly improves compile times when multiple C++ files are specified on one command line. In fact, the benefit of batched builds can exceed the benefit of PCH. A DAG optimizer would search for a set of C++ source files that produce object files in the same directory and rewrite the individual command lines into one. When rapidly iterating, it would be valuable for a build system or test runner to sort such that the most-recently-failed compile or test runs first. However, when hunting test interdependencies as part of a nightly build, you may want to shuffle test runs. On machines with many cores but slow disks, you want to schedule expensive links as soon as possible to mitigate the risk that multiple will execute concurrently and thrash against your disk. Tup is a significant improvement over the status quo, and I have personally confirmed its performance — it’s lightning fast and it scales to arbitrary project sizes. However, without out-of-the-box Windows support, a mainstream general-purpose language, and a model for community contribution, I don’t see Tup rapidly gaining traction. With the changes I suggest, it could certainly replace Make and perhaps change the way we iterate on software entirely. Next, I intend to analyze prebake. I just found out that Sphere, the RPG creation system that I started developing eleven years ago, has a thriving community! A good 2/3 of all of the hits to aegisknight.org are to http://aegisknight.org/sphere, so I made sure to point people on that page to spheredev.org and the spheredev.org forums. Yeah open source! Open sourced our pstats viewer! IMVU has benefited greatly from open source software. Large components of our client and website are built on top of various open source projects. In fact, you can see the list of software on our technology page. Well, I’m happy to announce that we’re beginning to contribute source code back! We have created a project on SourceForge and released our first standalone tool: pstats_viewer.py. pstats_viewer is a tool for browsing the data stored in a .pstats file generated by the Python profiler. Author Chad AustinPosted on May 21, 2008 March 27, 2009 Tags imvu, opensource, python1 Comment on Open sourced our pstats viewer! In Don’t Invest in the Wrong Code, Tom Kleinpeter has created a wiki for pitfalls in third-party libraries. Sort of a consumer reports for software engineers. I think this is a great idea, and would have helped us a lot at IMVU. Please contribute! Let’s see this thing get critical mass! Subscribe to a Google Alert with your project’s name and watch users “in the wild”. Mailing lists are fine and all, but many people won’t bother sending their problems or even first impressions to you or the project mailing lists, even if they’ll write in other forums or blogs. Google Alerts will give you a broader perspective. Today I updated my backup-sourceforge.py script to reflect the new SourceForge backup policies, including support for Subversion repositories. You can download it on my scripts page. It used to be a bash script, but the second you’re using commands like trap "error" ERR and set -e and cd "`dirname \"$0\"`", it’s worth rewriting in Python. Interestingly, the Python came out surprisingly terse and clear, unlike past experiences writing shell scripts in Python. Also, it used to call into the adocman project (some Perl scripts provided by SourceForge to make backups easier), but it was such a pain to set up CPAN and install the required Perl packages that I decided I would reimplement their xml_export tool in Python and urllib2. I managed to replace xml_export with fewer than 20 lines of code. Python really does have “batteries included”!